Ambarys Rendar is the Dunmer innkeeper at the New Gnisis Cornerclub in Windhelm. A true supporter of the Empire, Ambarys flies several Imperial banners on the second floor of the Cornerclub, and keeps a set of Imperial armor. He despises the Nord population of the city, a hatred he will frequently vocalize. He runs the cornerclub with the assistance of his employee, Malthyr Elenil, who shares his hatred of the Nords. He traveled to the city as a refugee during the Red Year, but did not realize the hostile reaction the local Nords would have to the Dunmer refugees. He intends to return to Morrowind as soon as he has the money to do so. Ambarys will work at the cornerclub for all of the hours of the day. He will never sleep or deviate from his work. Ambarys wears a set of clothes and a pair of shoes. He carries an iron dagger to defend himself. Besides that, he carries a selection of common loot and gold. 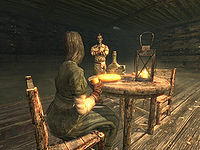 Nords visiting the New Gnisis Cornerclub will not get a warm welcome from Ambarys. He will sarcastically say: "Oh splendid, another Nord. ", or: "Come slumming to the Gray Quarter, have you?" He will have a much kinder comment for Dunmer customers: "Welcome, brother/sister. Please, enjoy yourself." He will also insult the Nord population at large with the claim that: "It's not the cold of Skyrim that gets to me. It's the stink from the people. " Ambarys might also vocalize his plans to leave Windhelm behind him for his homeland: "When I've made enough money, I'm going to return to Morrowind in high style." He will make remarks relating to the Civil War about whoever controls Windhelm. While Ulfric Stormcloak holds the city, he will say: "Things have been a lot worse around here since Ulfric took over." If the Imperial Legion defeats the Stormcloaks and seize Windhelm he will instead have a much cheerier outlook on the situation: "At long last, Windhelm is free. No longer must we suffer persecution at the hands of Ulfric Stormcloak." When asked for rumors, he may point you to Aventus Aretino with the words: "I was walking by the old Aretino Residence, heard the little boy, Aventus? He was chanting. It was the Black Sacrament, I tell ya." He will also give his personal view about magic, should he be asked about it: "The College of Winterhold is the only place in Skyrim open-minded enough to teach magic. Although Ulfric's court wizard has been known to take on apprentices once in a while." When ending a conversation with Ambarys, he will tell you to talk to him again if you require a drink: "If you need another drink, I'll be right here." He will also invite you to spend some time at the bar with the remark: "Have a seat, there should be plenty of space." During Blood on the Ice he might make a remark about how he does not care for the women who have died: "Apparently some Nord women were murdered. Not sure why I should care." Asking him about the murders will have him say it is not his issue until a Dunmer has been victimized by this: "None of that matters to me. Until someone takes a Dunmer, I let Windhelm deal with its own problems." Asking him about how the Dunmer are treated in Windhelm will have him reply: "Well you see where we have to live. This forgotten alley. All the filth from the upper quarters flows downhill, like they say. Good luck getting one of the guards to help with anything. I tried to get Ulfric to even come down here to see the squalor, but the High Lord of His Mightiness couldn't find the time." Asking why so many Dunmer live in Windhelm will have him explain: "Where else would we be? When the Red Mountain burned, you could scarcely breathe in Morrowind. So we came west. Windhelm is the first city on that road, and here we are. If we had known the Nords would be so unwelcoming, we may have kept walking." Ambarys Rendar will occasionally pester Suvaris Atheron about her work for the Nords. He might ask her about her work for the Cruel-Seas, despite her working for the Shatter-Shields (see bugs). One of Suvaris Atheron's brothers, Aval Atheron, will mention his respect for Ambarys: "I have a lot of respect for Ambarys Rendar, but his views are a little extreme." 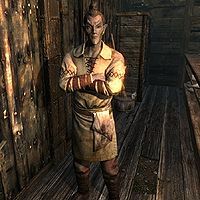 Asking Malthyr Elenil why he does not return to Morrowind will have him say that Ambarys is one of a few reasons that he stays: "Not a day goes by that I don't think about returning to the ancestral home of my people. Still, even with the rough treatment we've had at the hands of Ulfric and his lot, I've got ties here. It's probably more trouble to pack up and leave than it is to stay. Besides, Ambarys can't run the cornerclub on his own." Ambarys will claim that Suvaris works for the Cruel-Seas, despite her not working for them. This line of dialogue either confuses the Cruel-Seas for the Shatter-Shields or it was accidentally written for Suvaris and not Idesa Sadri, a Dunmer in the employ of the Cruel-Seas. Ambarys will continue to talk about how Ulfric will not come to see the plight of the Dunmer and Argonians even if the Empire has retaken Windhelm and Ulfric is dead. ? This page was last modified on 4 July 2018, at 01:38.